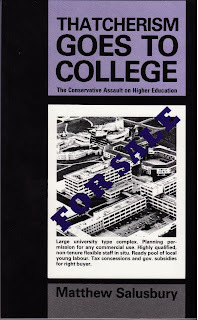 I was absolutely gob-smacked to find that my book, Thatcherism Goes to College, is still being quoted (let alone read) almost 20 years after it appeared, and by somebody only just out of college herself. An October 2008 article by Laurie Penny in still relatively cool leftie magazine Red Pepper quotes my book. The function of a degree has perceptibly shifted from a rigorous course of academic and intellectual training to a necessary ticket into a certain class of ‘graduate’ professions – many of which would not have required a degree even ten years ago. As this shift has occurred, colleges, departments and university careers services have aggressively pursued a corporate agenda. In 1989, Matthew Salusbury observed in Thatcherism Goes to College that ‘Bristol University’s history department was proud of the number of bankers and financial service personnel they had produced, using the fact to justify their continued existence. They would not have recognised the argument that a life in the stock market was as much a waste of a history degree as a lifetime’s unemployment.’ Two decades on... Read the original Red Pepper article. The quote comes just after the 'Corporate agenda' sub-heading. There's a surprising number of copies of Thatcherism... on Amazon, for up to £60. Email me if you want one new for £2 plus postage. George Young MP (Con) is not such a big fan of the book, as is evidenced by this extract from Hansard, in which he fails to get very far with his proposal to make the taxpayer foot the bill for MPs' actions for libel and 'malicious falsehood'. If, as he claims, any 'costs were paid', I think my publisher would have told me about it. Curiously, his speech came years after the incident, at about the time I started coming into contact with Reclaim The Streets. What a strange coincidence. Here's a sneak preview of a page from Hoe Dieren op Ijlanden Evolureen (How Animals Evolve on Islands), a Dutch language book due out in January 2009. My source didn't tell me the authors or publisher, but they did tip me of that one of my pictures was on page 16. This is by arrangement with me, as part of a swaps deal in which I got a licence to use some copyrighted images from the Athens Museum of Paleaontology in my forthcoming Fortean Times article on pygmy elephants. 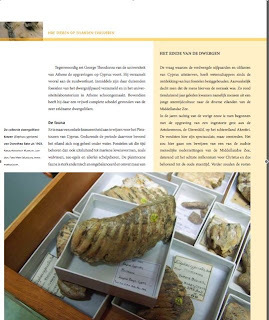 My pic at the bottom of the page shows molars (teeth) from prehistoric adult pygmy elephants in the Bate Collection in the Natural History Museum London, from Malta and Cyprus. The text looks at the reasons for their extinction. 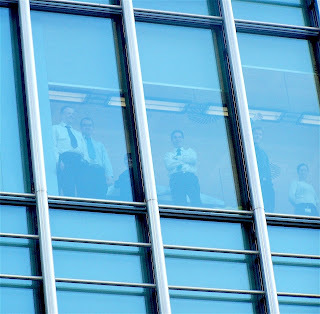 While on the subject of troubled institutions, here's a photo I took in (for them) happier times of the dealers gathered at the window of the Lehman Brothers London office, having a giggle at the Mayday 2007 anti-capitalist protesters gathered in the square outside. The Lehman Bros. dealers seemed much amused at the anti-capitalists, who were protesting what they saw as the unsustainable nature of the financial system. Who's laughing now? As you can see from this Woolworths sign for Woolworths Glastonbury, taken in 2006, at least one branch of Woolies had been in a bad way for some time. So it came as no surprise to hear they were being sold off for a quid. I immediately went down to my nearest one (a lot further away than my nearest branch was a year ago) to circle vulture-like around their special offers. Apart from a lame 'three for two' deal, there was nothing much to write home about in terms of price-slashing.